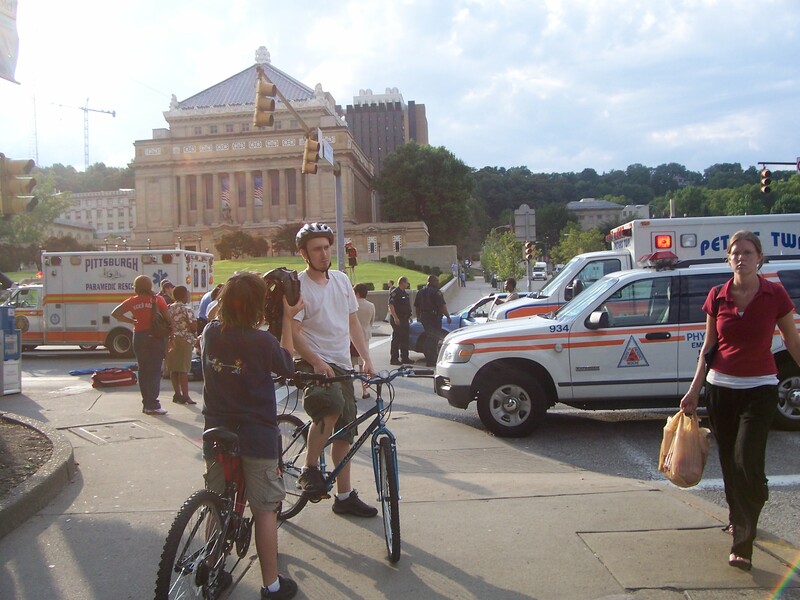 A violent head on collision with a pedestrian on the intersection of Fifth and Bigelow sent the pedestrian 10 feet from the point of impact to the pavement around 6:40 p.m. on the evening of July 18, near the University of Pittsburgh. The unidentified victim had hit the pavement of the road where the PAT bus lane is. The road pavement was stained with the blood of the victim. The cars windshield was badly shattered at the point of impact with the pedestrian. An African-American woman who was at the wheel of the car and had her young son with her was totally in shock as the son gets out of the car unharmed. “I was keeping to the speed limit especially since I have my son with me. There was a green light and the next thing I know she is on my windshield. I still do not know how it happened. That is all I can remember”, she said. For ¼ of an hour, the traffic at the intersection of Fifth and Bigelow was at a standstill as the victim was attended to by Peter’s Township EMT personnel who happened to be driving in the area. 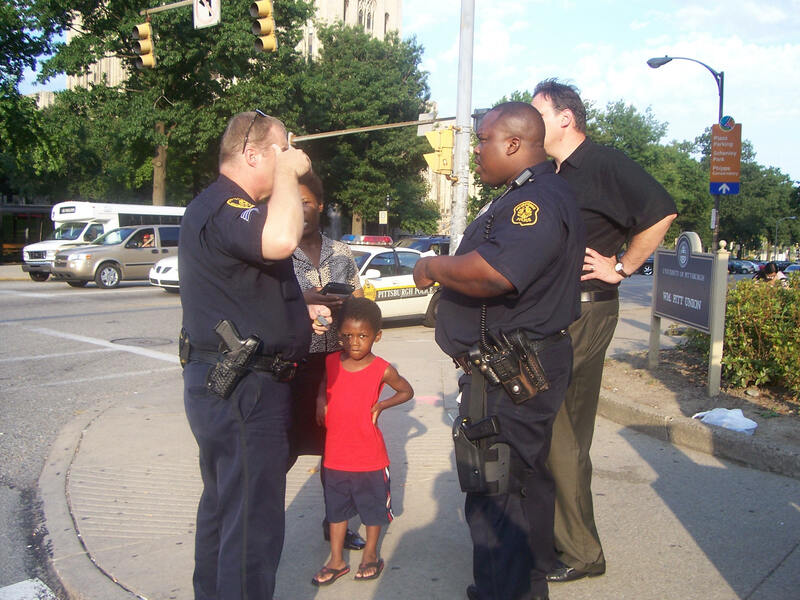 They were joined by the City of Pittsburgh police and Pittsburgh Paramedic rescue! 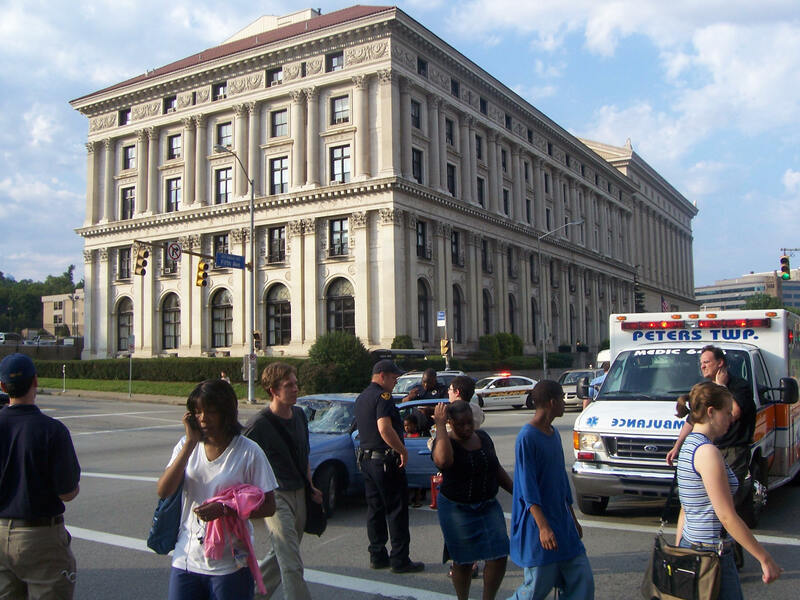 As paramedics attended to the victim, Police officers from the City of Pittsburgh interviewed every witness at the scene of the accident. 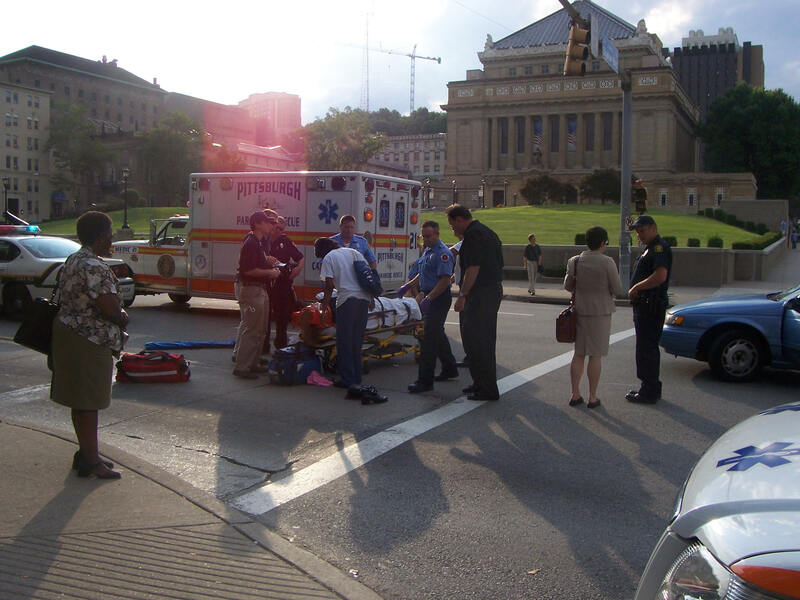 Witnesses attended to the victim as paramedics strapped her to a gurney to take her to the emergency room at University of Pittsburgh Medical Center. An unidentified female witness who saw the accident first hand told police that she saw the victim get hit, while crossing the road and fell couple of feet away at the point of impact. Other witnesses recalled hearing a big thud and thinking it was a vehicle-vehicle collision but not a pedestrian hit until they saw her hit the pavement of the road. A male witness who did not identify himself wished he had never seen the accident as he recalled details of what transpired as he was coming towards his car. The response time of the emergency personnel was immediate because of the witness’ quick thinking. “I flagged down a paramedic from Peter’s Township who just happened to be coming through the area. They stopped to give assistance to the lady. She was pretty badly hurt from what I saw. It was a fairly violent collision. It was just an unfortunate thing and wished I had not seen it and hoped I could have helped out in a little way”, said the male witness. He also recalled later how her back was broken and one of her legs completely broken and visible at a 90 degree angle! As she was let go to return home, another witness who saw the accident was frantic that the police officers were releasing her. “I am from Indiana, PA! Where I come from this would never happen. She just hit her and murdered her and they are letting her go. She MURDERED her. I saw the paramedics put a sheet over her”, shouted the witness. 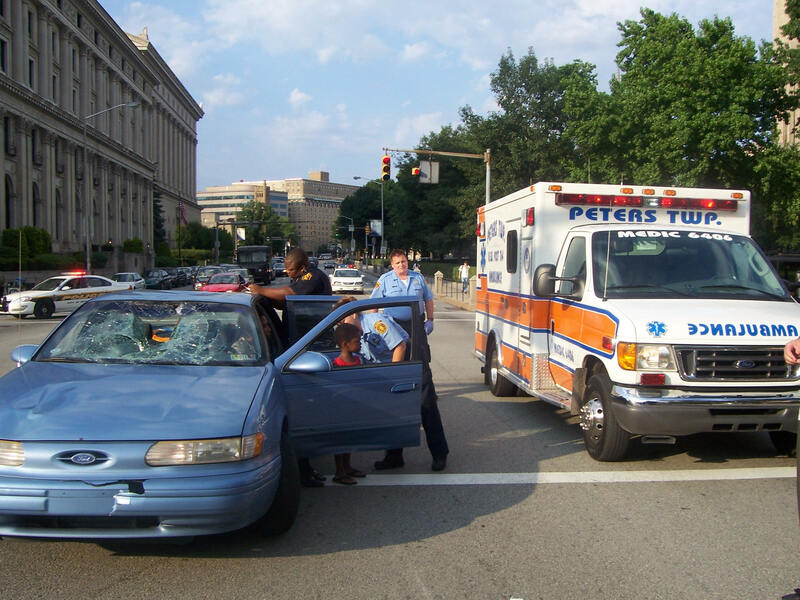 He had to be calmed down by another witness who let him know that she was not dead but talking to the paramedics and the woman did go on a green light when the victim was hit. The condition of the victim and where she was taken was not known!